Gardeners and theologians alike are being inspired by the recent launch of the Bible Garden Book. The book features 68 plants of the Bible Garden which is located at the Australian Centre for Christianity and Culture in Canberra. Each plant is listed with its common and botanical names, a photo and a short description, and where it is mentioned in the Bible. The book is written by friend of the Centre John Miller and was officially launched on March 14, 2017 at the Pavilion. 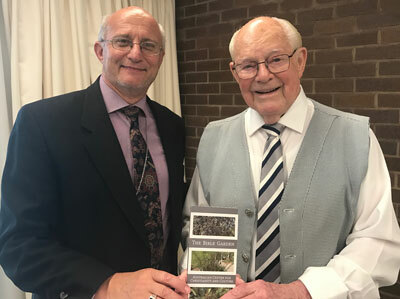 Mr Miller had come up with the idea of the book after visiting the garden and approached the Centre about wanting to provide visitors with more information. "Then it struck me that the book could have much wider appeal than just our visitors," he told guests who attended the launch. "We were not in the business of horticulture - we were there to lead people to God. The book should spell out the Bible texts but also include a spiritual message for each page, something good for the soul," he said. Mr Miller said he set about researching plant and horticultural references in the Bible and discovered most of the references come from the Old Testament. "This is not a Christian Book - it is a Jewish Book. It is full of the truths Jesus hungered for and learned from His own people. Through them he found the way to God, for Himself and for everyone else ever after," he said. The book launch was reported on by the The Canberra Times. The Bible Garden was officially opened in 2008 with a benevolent grant from The Bible Garden Trust, a perpetual trust established by the late Gerald Hercules Robinson. The Bible Garden was planned and maintained by Brad and Derani Ayers. Books are available for purchase at the Centre for $20. Read more about The Bible Garden.